Go-Fishing.co.uk - The UK Gateway to Worldwide Fishing This Jet Power Fishing Bait Boat with Fish Finder Sonar is a must have for all serious anglers. 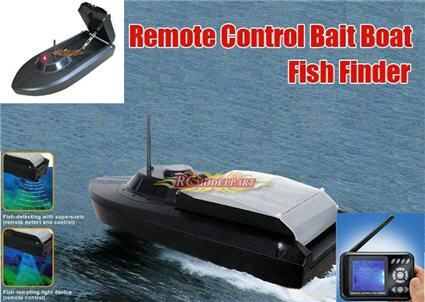 Never before have anglers been supported by so much High-Tech equipment as with this new Bait Boat with Sonar! The new One Hand Transmitter which comes with this boat means that you can accurately steer the boat to exactly where you want it before you unload the ground bait or your terminal tackle by deploying the tipping loading bay. The large clear display constantly keeps you up to date with all of the information which you need around the area of the boat such as the water depth, amount of fish in the area, the water temperature and the battery power of both the boat and the transmitter helping you find the spots where the real (big) fish are and place your tackle where you cant cast. The boat is powered by 2 jet motors especially designed to prevent weeds clogging them and it is fitted with position lights to draw the attention of nearby fish.